Iowa State senior Naz Mitrou-Long says he would never have stayed at Iowa State had it not been for the effort of Drake coach Jeff Rutter. 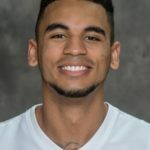 It was Rutter, then an assistant under Fred Hoiberg, who took Mitrou-Long under his wing during a freshman season that saw him appear in only 18 games. They will be on opposite sides when the Cyclones play the Bulldogs in the Hy-Vee Classic in Des Moines. Rutter says even though he is a few years removed from the Iowa State program he remains a Mitrou-Long fan. Drake is 1-8 on the season and this will be Rutter’s second game as head coach since taking over for Ray Giacoletti. His chore this week has been to find a way to defend Mitrou-Long and a Cyclone team that averages more than 82 points per game.